You may recall a time in early 2013 when I set a goal for myself involving a “Reading Bingo” card. This was in the halcyon days of the year, months before I even considered some of the big transitions that were going to take place in 2013. Ah, the bliss of ignorance. The Bingo challenge wasn’t a complete failure. It did push me to read some books that I would not have otherwise explored this year. There are definitely boxes on this Bingo card that I still want to read in 2014. I want to read a book with a Native American female protagonist. I want to read Chains and Forge by Laurie Halse Anderson (Revolutionary War historical fiction). And it is high time that I finally read something by Frances Hardinge! But even though I still want to check those boxes, I have decided to approach my reading differently for 2014. You may have seen this article by James Clear shared on social media recently. It talks about goal setting, and how identifying an end point goal may not actually be the most productive way of changing your habits. Instead, Clear encourages us to develop a system of behavior that will help us get to an end point. My current daily process does not include a lot of time for reading, and that is something that is preventing me from accomplishing my reading goals. In 2014, I want to start changing parts of my daily process to make more time for reading. For example: when I get home from work around 8 pm, I scarf down a meal and then kill time reading the news/reading blogs/frittering away my life on Pinterest. Then I watch a TV show or too and head to bed, where I read before falling asleep. Although it pains me to say it, I could live with less television/Pinterest. And changing that system of behavior would give me more reading time, which then gives me more room to diversify my reading – the whole point of making a Reading Bingo card for myself. Enough about me. How was 2013 for you as a reading year? Did you get to the books you wanted to read? Is your to-read pile still stacked to the ceiling? Will you be altering your reading ‘systems’ in 2014? 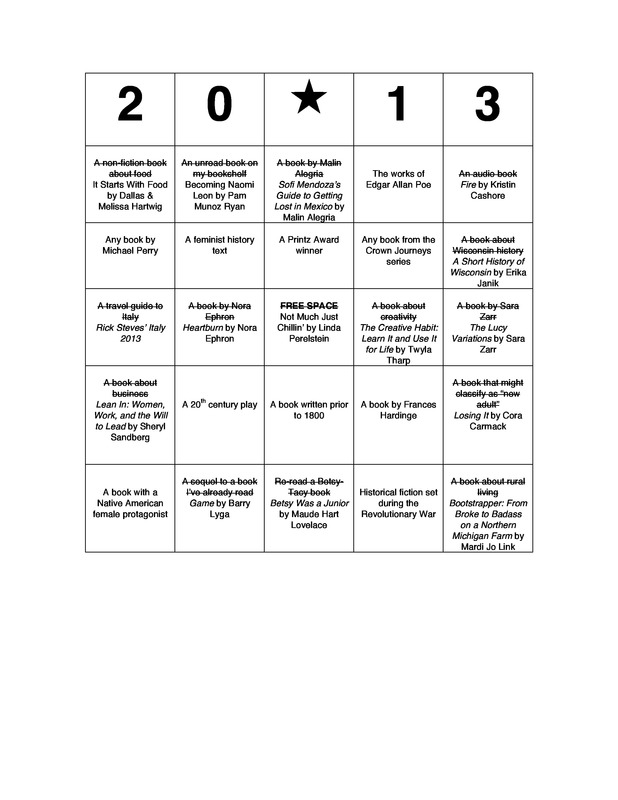 This entry was posted in Miscellaneous and tagged 2014, goals, reading bingo, reading habits. Bookmark the permalink.